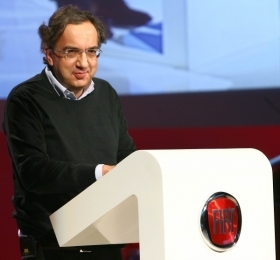 Fiat CEO Sergio Marchionne will announce Fiat's 5-year strategic plan on Wednesday. On Wednesday, he will reveal just how interconnected the two carmakers will be in the coming years. Wearing his hat as Fiat CEO tomorrow in Turin, Marchionne will unveil a five-year plan for the Italian carmaker. The Fiat plan calls for broad cooperation between Fiat and Chrysler in many operations, such as manufacturing, marketing, sales and finances. Marchionne has the companies working together in ways that luxury carmaker Daimler AG never dreamed of in its troubled decade-long marriage to Chrysler. • Near-luxury brand Alfa Romeo will build a mid-sized sedan and station wagon in the United States at Chrysler factories. The debut of the Alfa Romeo Giulia in 2012 would mark the return of Alfa to the United States after a 17-year absence. Using the same Compact Wide architecture underpinning the Giulia, Alfa also will build a large crossover. • The Chrysler and Lancia brands will share platforms. For example, Lancia will get a version of the Chrysler Sebring replacement due later this year and a version of the Chrysler Town & Country minivan. • A small Fiat car with four doors and styling similar to the 500 will be sold in the United States in 2013. • A possible Fiat compact sedan that will be imported from a Fiat joint venture factory in Serbia for sale in the United States. If approved, it will arrive in 2013. • A Fiat-badged version of the Dodge Nitro SUV will be sold in Europe by the end of this year. During the presentation Wednesday, Marchionne and his lieutenants are expected to give updates on the financial performance of Fiat and Chrysler. Sales targets for 2014 for the combined companies are expected. The companies have combined in other areas too. Olivier Francois is running both Chrysler and Lancia brands and acts as global marketing chief for both Chrysler and Fiat. On the manufacturing front, Chrysler's North American factories will build as many as 400,000 Fiat, Lancia and Alfa Romeo brands by 2014. Marchionne's plan calls for reducing the number of platforms used by the two automakers and producing sufficient vehicles on each platform to gain economies of scale. Said Cole: "Scale is pretty important. There's a mutual need that's going to drive things. They've got to work on a joint basis. And I think that's happening."